KOUROU, French Guiana — A modest European-built spacecraft tuned to test the delicate, cutting edge technologies required to detect gravitational waves, a measurement that scientists say could yield unforeseen discoveries about the universe, is awaiting liftoff aboard a solid-fueled Vega rocket this week. The mission was supposed to blast off early Wednesday, French Guiana time, but officials pushed back the launch at least one day to evaluate a potential problem with its Vega booster. 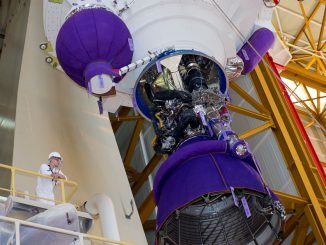 Launch is now scheduled for no earlier than 0404 GMT Thursday (11:04 p.m. EST Wednesday), or 1:04 a.m. local time in French Guiana, where the Vega rocket, constructed by Italy’s ELV and Avio contractors and operated by Arianespace, is ready for its sixth flight since debuting in 2012. The Vega rocket’s missions to date have mostly shot Earth observation satellites into orbit, but the middle-of-the-night blastoff early Wednesday will carry an experimental spacecraft with sensitive laser ranging devices, low-impulse micro-thrusters, and two perfectly-crafted gold-platinum cubes to be suspended in free fall inside an electrostatic cage in the weeks after liftoff. Scientists say such technologies, many of which have never flown in space, are necessary for an ambitious multi-spacecraft observatory expected to launch around 2034 to study gravitational waves, low-frequency ripples predicted by Albert Einstein’s general theory of relativity to be echoing through the cosmos. Named LISA Pathfinder, the European Space Agency-led mission is heading for an orbit around the L1 Lagrange point, a gravitationally-stable location 1.5 million kilometers, or 930,000 miles, from Earth in the direction toward the sun. 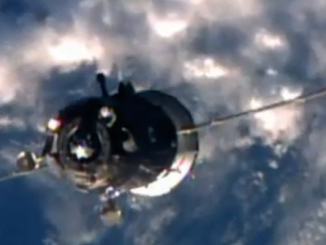 The hexagonal space probe needs to get far away from the pull of Earth’s gravity for its mission. Rounded cubes made of a gold-platinum alloy buried in the heart of LISA Pathfinder are cocooned inside launch restraints for liftoff, then ground controllers will command the masses to release in a complicated procedure engineers were unable to test on the ground. Two mechanical fingers holding the test masses will extend needle-like appendages to contact the test masses in the final step of the release sequence, then the device will quickly pull away — in microseconds — to leave the cubes floating inside their chambers. Engineers say electrodes surrounding the cubes will counteract any tiny imperfections by pushing and pulling the masses toward the center of their housings. Micro-thrusters mounted on the exterior of the spacecraft will also swing into action, maneuvering the satellite with tiny pulses. 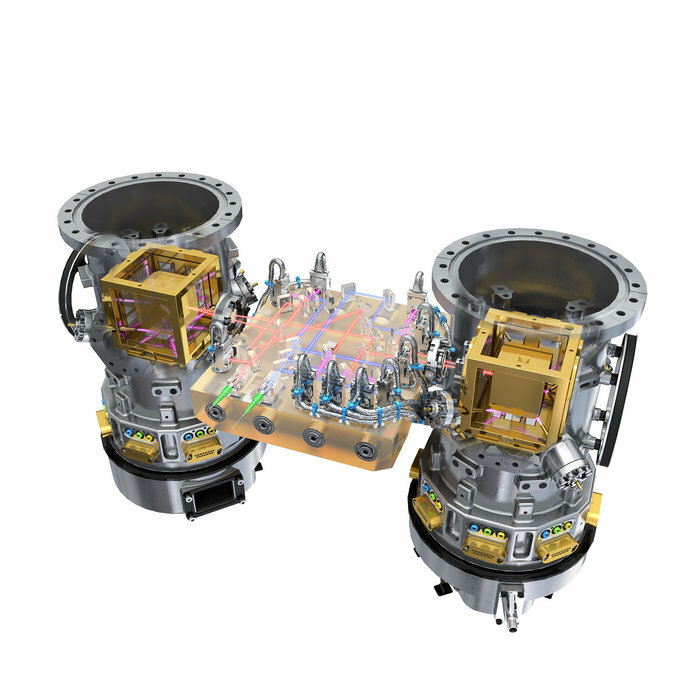 Accelerometers aboard LISA Pathfinder will precisely track its movements, and a control computer will send signals to the low-thrust rocket packs outside the probe to continuously correct. The test cubes, measuring 46 millimeters (1.8 inches) on each side, will be suspended in electrostatic fields inside housings separated 38 centimeters (15 inches) apart. NASA is a partner on the LISA Pathfinder mission, providing its own U.S.-made micro-thrusters and control system. The European and U.S. control systems will take turns operating for 90 days each over the mission’s 180-day primary mission, which is due to begin in February after the craft’s arrival at L1. Astronomers say gravitational waves coming from immense objects in the distant universe, such as merging black holes and galactic nuclei, can yield new insights into the fundamental physics of the universe in ways impossible to study with traditional observations of light waves. Built by a pan-European consortium led by Airbus Defense and Space’s UK division, LISA Pathfinder is purely experimental. Its small size — about 6.9 feet (2.1 meters) in diameter — is too small to detect the low-frequency gravitational waves themselves. The gravitational wave observatory planned by ESA, with NASA participation, is expected to cost well more than a billion euros, or $1.05 billion. The real observatory will include up to three spacecraft stationed millions of kilometers apart, with isolated reference cubes that lasers will track for perturbations that could only be explained by gravitational waves. The European Space Agency paid 430 million euros, or $455 million, for LISA Pathfinder, excluding contributions from NASA and ESA member states. 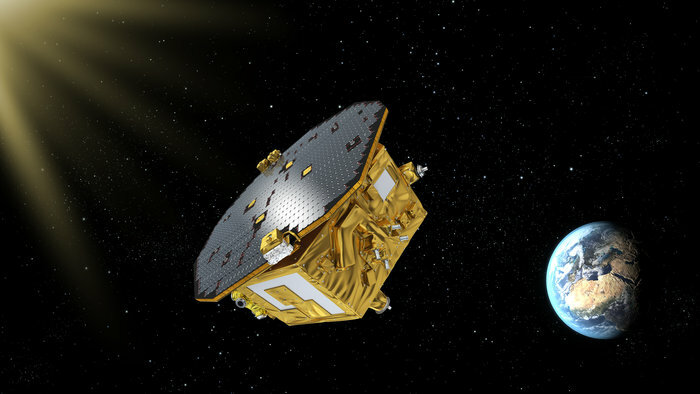 ESA authorized full development of LISA Pathfinder in 2004, with a launch then expected in 2008. Technical challenges with the craft’s control thrusters, and the caging mechanism designed to protect the test cubes during launch, forced a delay in the launch. A laser ranging system will monitor the motion of the test cubes, tracking their positions to one thousandth of one millionth of a millimeter, demonstrating the precision required for the future full-fledged gravitational wave observatory. LISA Pathfinder was conceived when the European Space Agency planned a different type of gravitational wave mission named the Laser Interferometer Space Antenna. The mission gets its name because it began as a proof-of-concept for the LISA project. 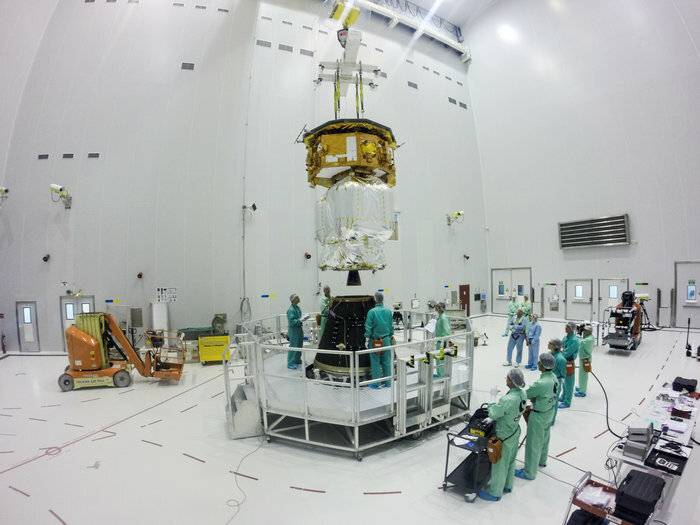 “All of us would rather be launching LISA, and being ready to do the astrophysics data analyis in addition to all the instrumental work,” said Ira Thrope, a researcher at NASA’s Goddard Space Flight Center and a U.S. member of the LISA Pathfinder science team. “The prime objective of this is technology demonstration, but it’s more than just a yes/no answer. You don’t just go up and say, ‘Yep, it worked, we’re done.’ What we really want to get out of this is a model for how these kinds of precision accelerometers operate in space. “We think we know all the different forces that could disturb a test mass, and all the different mechanisms that could basically mask a gravitational wave, and one of the purposes of LISA Pathfinder is saying did we get them all controlled and did we really understand what they all were,” Thorpe said in an interview with Spaceflight Now.